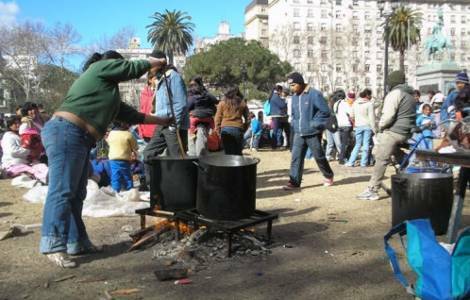 Buenos Aires (Agenzia Fides) - A particular event took place yesterday in Buenos Aires: thousands of people marched and invited other citizens to food courts organized as "popular pots" (ollas populares), to share something to eat, as a sign of protest against the current government of President Macri. The thousands of participants in the demonstrations, in different parts of the capital, paralyzed Buenos Aires. The aim was to ask the government to stop the increase in prices of basic household products and propose to declare food emergency. "We are one step away from the paradox that in a country that has jobs and that produces food for 400 million people, hunger is imposed on the most humble neighborhoods, the poorest, and puts social peace at risk", said Yesterday Daniel Menéndez, national coordinator of the "Barrios de Pie" association, one of the organizers of the demonstration, according to the note sent to Fides. Also present was one of Argentina's largest workers' associations, the Confederation de Trabajadores de la Economía Popular (CTEP), which asked President Macri to reformulate his policies so that people "can eat and live in peace". According to the local press, the government is looking for the best solutions to tackle one of the worst crises ever in Argentina: "We want to exploit the potential of the structures (of the Catholic Church and other churches) to ensure that assistance reaches those who need it most", said a head of government, commenting on the food crisis that the authorities themselves recognize. On Friday 7 a first meeting was held, on the initiative of the Minister of Health and Social Development, with the Caritas authorities. Mgr. Oscar Ojea, Bishop of the diocese of San Isidro and president of the Argentine Episcopal Conference (CEA), appointed his auxiliary Bishop in San Isidro, Mgr. Martín Fassi, responsible for the coordination of this initiative. The government also made an appeal to t evangelical churches, asking for help in the distribution of food. According to some observers, it seems that the Catholic Church is close to the government, but the conclusions of the Congress of Córdoba, last week, entitled "Repensando la política", show the opposite. The event, organized by the Social Pastoral of the Episcopal Conference in the non-electoral years, strongly criticized the management of the current Presidency of Argentina: "the people await political leaders who represent them, who are not intimidated by the great economic powers and who do not fall into corruption", reads the conclusions.